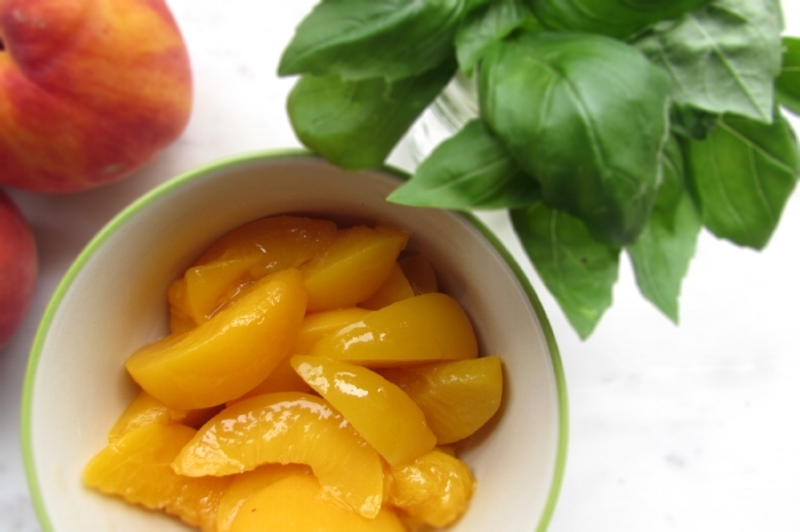 Peaches and basil are a wonderful flavor combination (have you tried the Peach Basil Cottage Cheese Smoothie yet??). Here they are combined with chicken for a quick skillet dish that is ready in less than 30 minutes, start to finish. I used canned peaches (packed in 100% juice) but nothing beats fresh peaches in season. If you have them, go for it! In Alabama, the city of Clanton is the state’s largest producer of peaches. 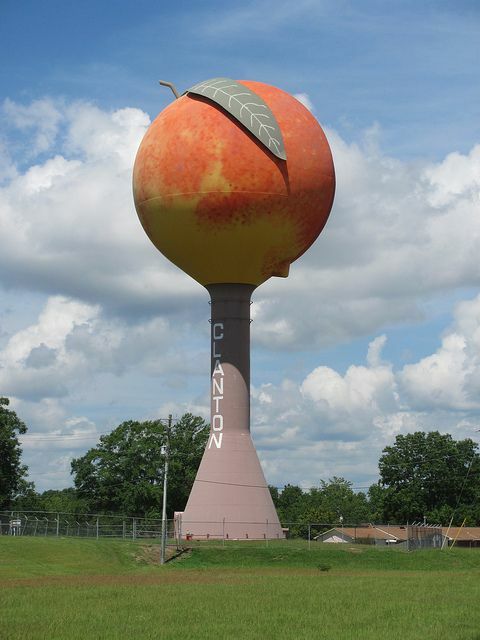 The water tower is in the shape of a peach, 120 feet tall and holding 500,000 gallons of water. Much like the Alabama-Auburn rivalry, in Clanton there is Peach Park versus Durbin Farms. Less than a mile apart these businesses have taken the neighborhood fruit stand to the next level, offering peaches and other fruits, vegetables, jams and jelly, homemade ice cream and baked goods to locals and anyone traveling I-65. Summer beach trips or any reason traveling south of Birmingham must include a stop at one of these from May to October. Emotions can run deep on allegiances to these two. I’m definitely Team Peach Park (fried pies with homemade ice cream – yum!!) but will still associate with those loyal to Durbin Farms! Maybe I need to do a little more market research/comparison there?! Be sure to serve this dish with rice, potatoes or bread – something that can soak up the tangy sauce! Add 1 tbsp olive oil to a skillet over medium high heat. Sprinkle salt and pepper over chicken. Place chicken in skillet and brown on both sides (about 3-5 min each side depending on thickness of chicken). While chicken is browning, place reserved juice in a measuring cup and add chicken broth to make 1 cup (if using fresh peaches, use 1 cup chicken broth). Whisk in the cornstarch, garlic, mustard, and ginger. After chicken has browned, add the liquid, bring to a boil and then reduce heat to a simmer. Cook for about 5-10 minutes or until slightly thickened, spooning sauce over chicken frequently. Add peaches and cook for about 2-3 more minutes. Remove from heat and add basil. Serve on its own or over rice.